an open [sketch]book: need i say more? or at least, i can't i can't. actually, i'm just relieved to know that there are so many other people with a Nutella habit. i've been struggling with mine for years. i take it day by day. this is brilliant! you forgot a word, you know, after "will". it's "not." LMAO!! So who won the battle of the wills? Suzanne! I'm here! Aren't we still friends? Don't you love me anymore? I'm lonely! Let's do lunch! HAha. Love this. Love your comment above my "nutella" too. So funny. Great illustration. 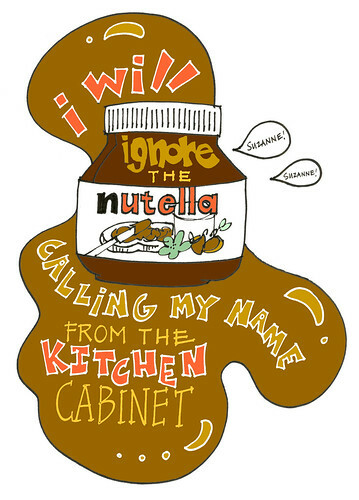 Mmmm, I can hear the twin calling my cupboard too..
why would you ignore such brilliance as nutella. i prefer mine paired with a simple spoon.